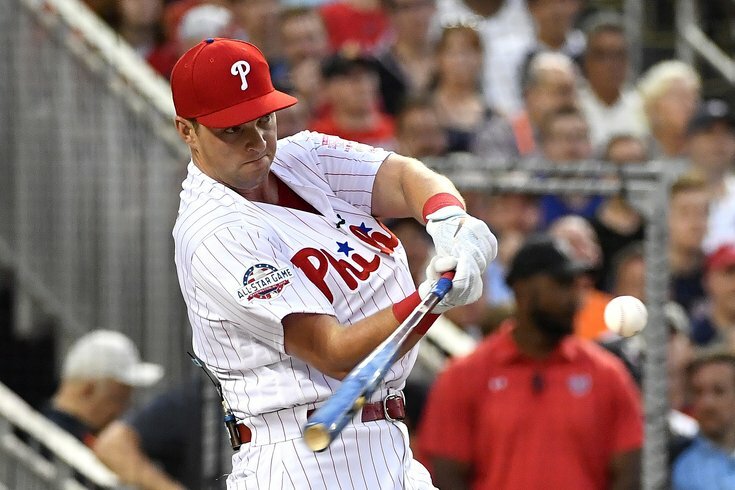 Philadelphia Phillies left fielder Rhys Hoskins during the 2018 MLB Home Run Derby at Nationals Ballpark. File this under things we didn't expect at the start of the 2018 MLB season: The Philadelphia Phillies are in first place in the National League East at the All-Star Break. The latest on Machado: Is he being traded to Dodgers? Perhaps as equally surprising is the fact that the Phillies, as recently as this weekend, were the reported favorites to land Orioles star Manny Machado. And while that's changed in the last 24 hours, the Phillies still remain as one of the two or three potential destinations for Machado. What hasn't changed, however, is the Phillies' surprising surge to the top of the division and the idea that this team has a chance to make it to the postseason. While a Machado-to-Milwaukee or Los Angeles deal could dramatically alter the landscape of the National League, the Phillies reportedly remain determined to be buyers ahead of the July 31 non-waiver trade deadline. Despite a disappointing series loss to the Marlins over the weekend, the Phillies remained in the Top 10 in most MLB power rankings this week. It'll be interesting to see how the trades made between now and the end of the month shake up these rankings. Matt Snyder 8 (-1) Heading to the break in first place: Good. Losing a series to the Marlins: Very bad. Ryan Fagan 11 (+2) Know who leads all MLB pitchers in bWAR? It’s not Chris Sale or Max Scherzer or Jacob deGrom or Luis Severino or All-Star snub Blake Snell. You probably guessed it already, seeing as how this is a blurb talking about the Phillies. It’s Aaron Nola, who has a 5.8 bWAR, slightly ahead of deGrom’s 5.4 and the twin 5.0s of Sale and Severino. Nola’s allowed two or fewer runs in 15 of his 19 starts and only has allowed 87 hits in 123 innings, while striking out 126. That’s Cy Young stuff, folks. Staff 10 (-2) The Braves and Phillies continue to be neck and neck in the NL East — if not for the red-hot A’s and the still-rising Dodgers, they’d be top 10 teams. The Giants aren’t doing quite as well as Atlanta or Philly, but they’re still trying to make the case that they’re contenders. All three will be interesting to watch as the trade deadline approaches.